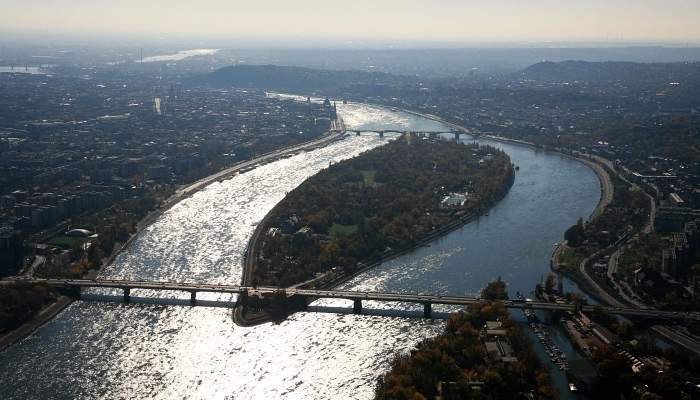 Shaped like a teardrop, Margaret Island is a 2.5 km island on the Danube River, in the middle of what is now the Hungarian capital of Budapest. Referred as Margitsziget in Hungarian, the island is named after Saint Margaret, Margit, the daughter of the 13th-century King Béla. Throughout history, it has been called different names, from the German Margareteninsel, the Turkish Kızadası and other Hungarian denominations such as Nádor-sziget, Palatinus-sziget and Dunai-sziget. First settled by the Knights of St. John in the 12th century, it was the home of various religious organizations such as the Franciscan, Augustinian and Dominican churches. It was the home of monks and nuns for decades, until the Ottoman Wars forced them to flee and their buildings were destroyed. In turn, the Ottoman Turks turned the island into a harem until they were expelled from Hungary. The island was declared a public garden in 1908, which prevented further residency buildings to be built. Since the 1980’s, entry for cars has been limited, which helps the island remain a natural and peaceful retreat in the middle of the busy capital. If you are into sports, the island has a rubber coating running track measuring 5.3 kilometers around it, which can be quite an inspiration for runners as they run around, admiring the riverside and both sides of Budapest. If running is not for you, or you just aren’t equipped for it during your travel, don’t worry! If you want to take a relaxing stroll among the trees or discover the island in a quick and fun way, we have the perfect solution for you! We are Go Mobility, a company focused on green and innovative mobility solutions. We have 7 years of experience renting bikes, go karts and electric vehicles on Margaret Island, helping both tourists and locals alike to have fun in their time in this relaxing getaway from the city. Take our rentals for a ride to explore one of the most soothing and pleasant parks in Europe, the unique garden of Margaret Island! Make sure to discover the island’s history and main sights with us! We’ll be happy to drop you any hints and tips for you.